Born Nigel Jonathan Davies in the East End of London, and genuinely within a mile of the Bow Bells, he was evacuated to a Herefordshire manor house during World War 2, staying as guest of J.B.Priestley, which had an enormous influence on the young Jonny Davies. Justin de Villeneuve is a man of many masks...he has been a boxer, a villain, a hairdresser (under the grandiose name of Christian St Forget), interior decorator, manager, photographer and poet. 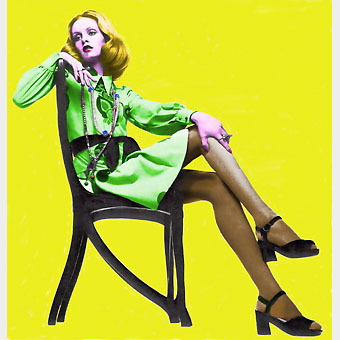 Of course, Justin is best known for launching Twiggy as the World's first supermodel. He is always reinventing himself and has made and lost many fortunes. Justin collaborated on pictures with Klaus Voorman (who did the Beatles seminal ‘Revolver’ cover) and the legendary Erte. He photographed Henri Lartigue in 1968, and created the iconic Marsha Hunt "silhouette" poster.